Kababs (kebab, kabob, kebap) are a popular street food. They are usually baked in a clay tandoor. The meat used to make a kabab is usually lamb. It depends also on local tastes…so they can be made using beef, lamb, chicken pork, fish and seafood, or even vegetarian, using mixed vegetables, potato, sweet potato, soya granules/chunks, tofu, paneer, etc. Kababs can be roasted in a clay tandoor or grilled on a grill pan, electric oven, charcoal grill, etc. Cuts of meat or even ground meat can be used to prepare kababs. Kababs can be served as an appetizer with cocktails along with a dip/chutney or as a side with Indian breads. We love kababs at our home just the way you do and enjoy them at restaurants or eat/pick up from dhabas (roadside eateries). We have excellent restaurants in Pune & we sometimes do order home delivery. The joy of making kababs at home is something to be experienced. The novelty of making your very own kababs is that you get to enjoy them the way you want to… you can adjust your spices as per your taste & make your own kabab mixes which can be different each time. 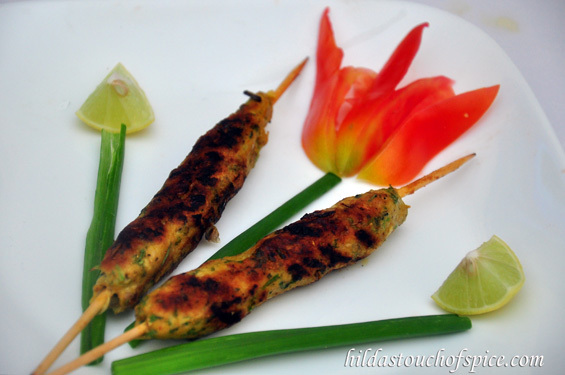 You need to pre-plan & marinate well in advance to enjoy delicious & melt in the mouth kababs. Today’s recipe is the well loved Chicken Seekh Kabab which is very simple, quick & easy to prepare. Even a beginner will be able to mold the kabab with ease & roast/bake/grill with confidence and relish them just the way you would in a restaurant. You can even make the Kababs and freeze them to be used at short notice. If you like the flavor of smoky charcoal in your kababs then check out the Butter Chicken without the tandoor recipe or click here. These chicken seekh kababs have always been appreciated well & I make them often… Generally I cook them on a charcoal grill or in an electric oven, but this time I used the grill pan! Oh! Did I tell you that I just Loooooove my grill pan?… it is my handy mate in the kitchen & such a blessing! First soak the bamboo skewers in water for about an hour. In a sufficiently large bowl, place all the above ingredients & mix well with dry fingers. Refrigerate the mixture for about an hour or preferably overnight so that it is well marinated. Oil your palms & shape the kabab on the bamboo skewers. Moisten your fingers lightly with water & smoothen the kabab if you wish. Place it on a tray making sure the kabab does not touch the bottom of the tray. Place the prepared kababs for about 15-20 mins in the fridge. Heat your grill pan & lightly brush with oil. Brush the kababs lightly with oil & place them on the hot grill a little apart from each other. Grill on each side for about 6 mins. Before turning over on the other side baste with a little oil. Chicken cooks easily & quickly so to retain moisture & succulence do not overcook. Transfer on to a serving plate & serve with your favorite dip or chutney. Chicken mince should have some fat in it or the kabab will not hold on the skewers. Do not wash the mince. It should be dry as possible. You may use a food processor to process the masala for the kabab. Basting is very important to retain the sheen, shine & moisture. Oil & moisten your palms with water to avoid the mince to stick to your fingers& palms. Well marinated meat is the secret to a good kabab.